If you missed last week’s post about taking care of the creative and inquisitive sides of our nature, check out the LARC list. 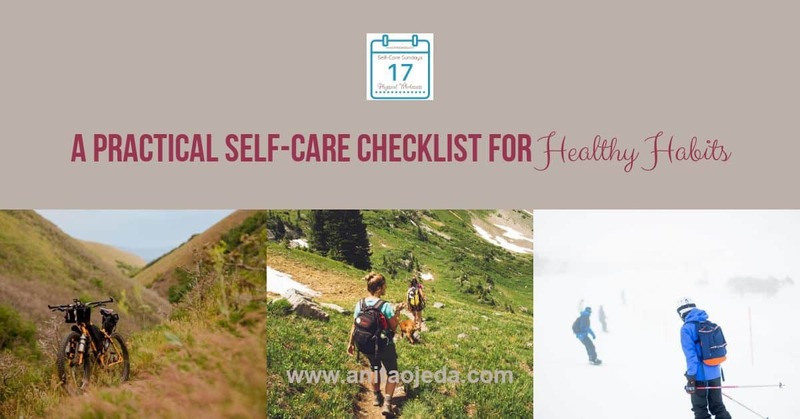 The week before that I went over the self-care checklist for creating habits for mental self-care. Most people have no problem making big goals about physical self-care, but I hope the acronym SWEAT will help you remember to focus on small habits that make a big difference. Make a habit of sweating at least three times a week. No, I don’t mean going outside where it’s hot. Exercise hard enough to break into a sweat and stay sweaty for a good 10-15 minutes. It doesn’t matter what kind of exercise you do—just make sure that you sweat. Sweating means that your heart has entered the aerobic zone. Experts advise getting 75-150 minutes of moderate to vigorous physical activity each week. Breaking a sweat will ensure that you get that ‘vigorous’ exercise. You don’t even have to do it all at once, either. You can purchase gadgets to help you measure your heart rate, or you can just set a goal to get sweaty five times a week. Just make sure you choose an activity that you actually enjoy (as much as one can enjoy getting sweaty). I love to run, mountain bike, and hike. In the winter time, I rely on aerobic exercise videos like Beachbody on Demand. You can also join online communities like Faithful Finish Lines (affiliate links) that will help you lose weight AND provide community, recipes, and workout videos designed for the not-so-in-shape. You can join their FREE five-day jumpstart challenge here. You’ve probably heard of the magic 10,000 steps a day guideline. That number may or may not be enough for you. The average American only walks about half that distance in a day. If you buy a pedometer or fitness tracker (some smart phones come with this feature built in), you can take a baseline reading and then aim to increase it by 1000 steps a week. In just five weeks, you’ll double your activity level. A self-care checklist might help you form those new habits. My favorite ways to get more steps? Never drive when I can walk. If I have to go to Home Depot and Walmart, I’ll park in the lot where I need to buy the most and walk to the other one first. Sit on a yoga ball and bounce instead of sitting on a chair. Bouncing keeps my heart rate at double its resting rate (52 bpm), so I think it qualifies as ‘stepping.’ It’s easier on my knees, too. Go birding…or take a sunset or sunrise walk…or get out and smell the roses every day. Use your feet, not your technology. Stand up and walk to your kids’ rooms to tell them it’s time for supper instead of texting them. If you have a dog, take it on regular walks. Involve your family—walk while your little kids bike around the block, or form a family habit of walking after dinner each evening. Rather than going on a ‘diet,’ learn to eat reasonable quantities of good things. Your ‘diet’ is actually what you eat and drink, so you’re always on one. Sometimes, it’s not a very good one. Don’t try to make radical changes all at once, either. In order to make lasting change in your diet, you’ll want to start small. Start cutting out white flour by using half whole-wheat flour and half white flour in your baked goods. Once that tastes good to everyone in your family, try all whole-wheat flour. Our taste buds will adjust and our bodies will start to crave the good things. For healthy recipe ideas, you can check out the recipes section of this blog. You can also try the concepts used in mindful eating. All too often we mindlessly eat without paying attention to why we eat, how much we eat, or when we actually feel full. Aim to move every hour during the day. If you have a FitBit or tracking device, set it to remind you to move each hour. My FitBit vibrates if I haven’t taken at least 250 steps each hour. You may have heard that ‘sitting is the new smoking,’ but scientists have shown that that statement gets overused without people really understanding it. Smoking will kill you a lot faster than sitting will. But just like the campaigns against smoking that started in the 80s, everyone seems to have jumped on the campaign to move more. And moving more is a good thing. Studies have shown a relationship between sitting for long periods of time and dying younger. Most people don’t realize how much they actually sit throughout their waking hours. Old-school thought said that as long as you got your 150 minutes of aerobic exercise in each week, you could sit with impunity. The new school of thought says that in addition to aerobic exercise, you need to make a point of moving throughout the day. The handy self-care checklist at the bottom of the page will help you for movement habits. If we don’t take time to stretch each week, we put our bodies at risk for injury. Personally, I hate taking the time to stretch because it’s a slow and controlled activity (aka, boring). I’ve discovered that stretching after a run or an aerobic workout works best for me. Combining cooling down with stretching helps me to relax after a vigorous workout. Stretching after an aerobic working will actually making stretching safer. Contrary to what I learned in P.E. class 40 years ago, you shouldn’t stretch before your workout. Once your muscle fibers have plenty of blood flow from your exercise, you’ll be able to safely stretch them. Remember to hold each stretch for 30 seconds and to not bounce. Don’t expect overnight results, but do faithfully stretch for at least five minutes, five times a week. If you need ideas, try You Tube. I found a great after-run stretching routine by an exercise physiologist. What habits do you struggle the most with? I’ve already shared my aversion to stretching (even though I know it’s good for me). You may have guessed that I don’t relish sweating, either! Great post Anita, I have augmented my SWEAT a little differently with having FM it has to be really gentle & not going beyond my boundary type of SWEAT. Otherwise I really pay for it with a flare. The older I get, the more I find the need to stretch, especially before I exercise. I guess our muscles kind of become rigid the older we get, right, Anita? And I do have a smart phone with the pedometer feature, but your reminder to take 10,000 steps makes me want to get a fitbit or something like that. I want to be more aware of the amount of steps I take each day! Thanks for giving us these important reminders! I’ve pinned at least two times and will try to do much more as I think of it! Stretching is my favorite part of working out, and I’m learning that on days when I exercise I feel better and have less achey-ness over all. I do appreciate your encouragement here. No, I don’t like stretching or sweating, either – or curtailing sweets. But I’m reminded of the saying that if we don’t change anything, nothing will change. So I definitely need to make changes. Thanks for the tips! Great acronym, and a helpful way to remind ourselves of the healthy habits we should be developing.